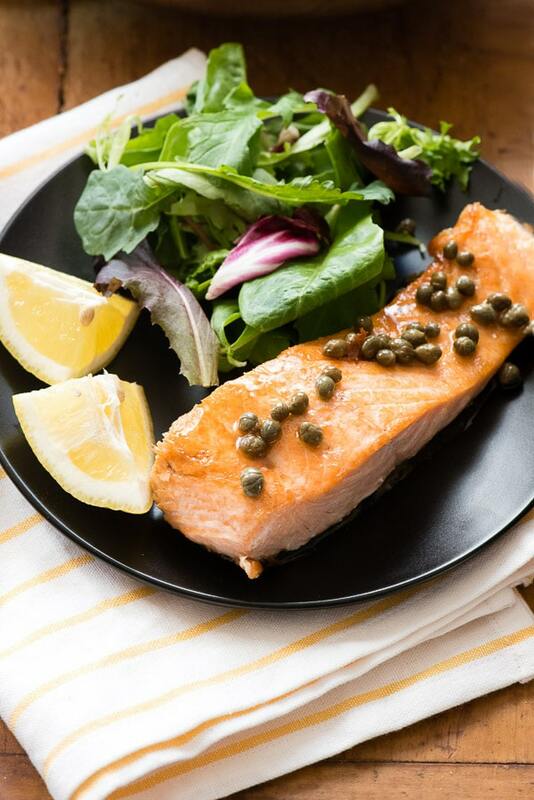 Pan Seared Salmon with Capers and Lemon takes four ingredients and 15 minutes, total! Perfectly cooked salmon fast enough for weeknights, great for entertaining! Originally published in October 2016; updated August 2018. Some recipes are so easy and simple it doesn’t feel right to call them a ‘recipe’. 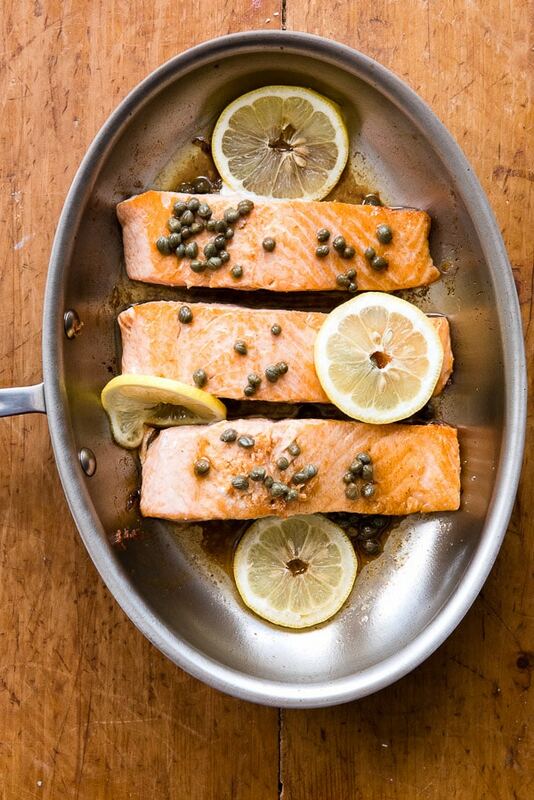 Pan Seared Salmon with Capers and Lemon is one of those. Can you call something with four ingredients that takes only 15 minutes a recipe? 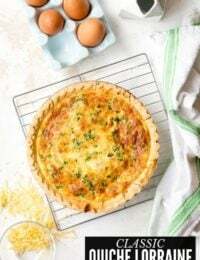 Whatever you call it, you’ll want this in your fast easy recipe collection for weeknights, entertaining or when you feel like something that feels fancy but doesn’t any time to make. Salmon is one of my favorite fish and one that is so easy to cook. 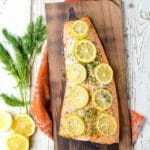 During the summer Charred Cedar Plank Salmon with Lemon and Dill recipe is on high rotation on my grill. I also love Salmon Tostadas which I picked up when visiting the famous El Tovar restaurant at the Grand Canyon. On a regular night however I need something fast and fabulous. 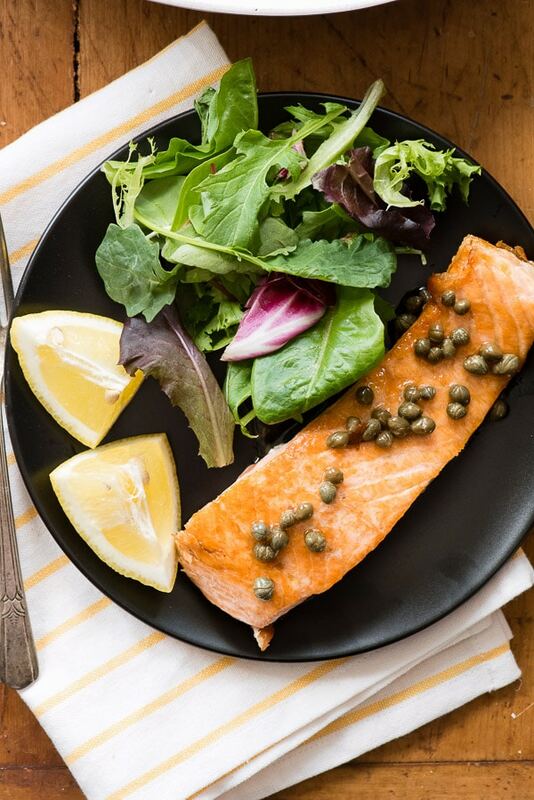 Pan Seared Salmon with Capers and Lemon is that recipe. The salmon cooks for a total of 8 minutes! The most difficult part of the recipe is slicing lemons for garnish. Not too taxing, right? Pan searing is a method of cooking over high heat which seals the juices and forms a slight crust on the food. It’s a fast and delicious way to cook salmon. 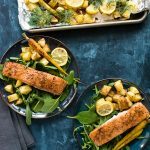 I love to serve the pan seared salmon atop greens dressed with a simple oil and vinegar dressing but any side dish will do (some freshly steamed haricot vert would be great). What Pan is Used for Pan Seared Salmon? A heavy skillet is all that is needed for stove top pan searing. The pan I used in the photos is a fish pan from All-Clad, the d3 Armor Fish Pan. . 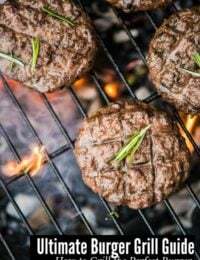 The recipe can be made with any heavy skillet. By looking at them you’d never have an idea of what they might be or how they taste! Capers are the unopened flower bud of a specific Mediterranean plant. They are typically pickled or salted which is how you’ll find them, in a jar, at the grocery store. Capers have a unique flavor all their own. Tangy, salty, almost sharp some would say. 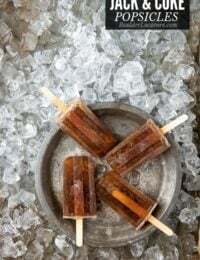 For a little ingredient they pack a big and distinct flavor! 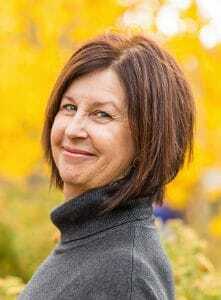 They are well known in recipes like Veal Piccata. 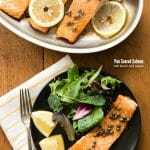 Their tangy flavor pairs well with the acidity in lemon for a rich, fatty fish like salmon. 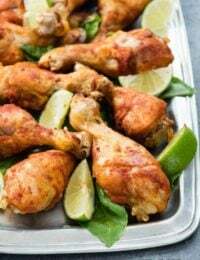 This recipe is a perfect example of quality ingredients combined making a fantastic dish (and not needing sauces or condiments). A heavy skillet is heated for 2-3 minutes, oil is added and the salmon is placed flesh down into the pan. The salmon is cooked for 3 minutes, turned over, and cooked 5 minutes with the skin down; until it is opaque and flakey. 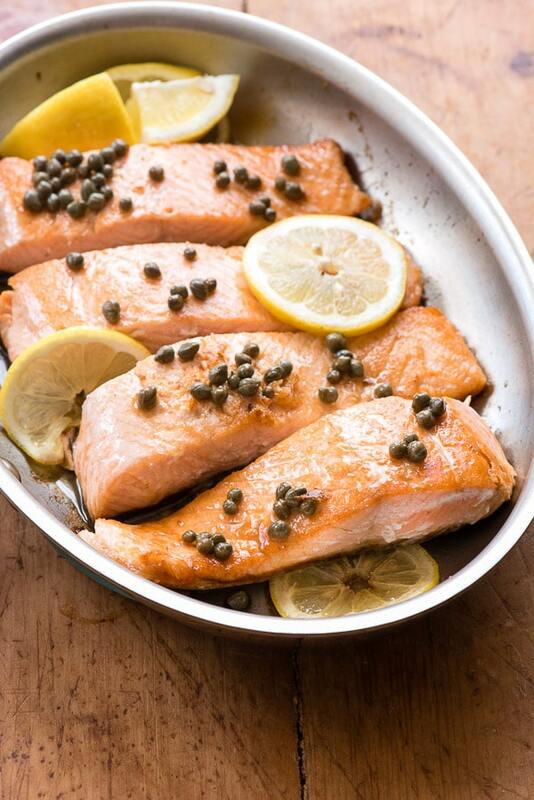 The salmon is removed, butter, capers and lemon are added to the pan, cooked briefly and drizzled over the salmon! 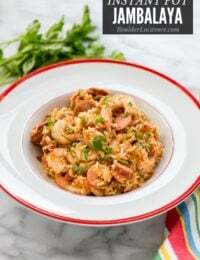 This recipe and other similar easy recipes can be found in our Easy Dinner Recipes collection. If you’ve tried this Pan Seared Salmon recipe please RATE THE RECIPE below! 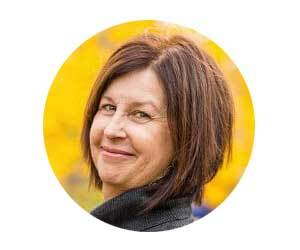 Please SUBSCRIBE and FOLLOW ME on FACEBOOK, TWITTER, INSTAGRAM and PINTERST to see more delicious food, travel and what I’m up to! Heat a heavy skillet over medium heat for 2-3 minutes until hot. Increase heat to medium-high and add the olive oil. 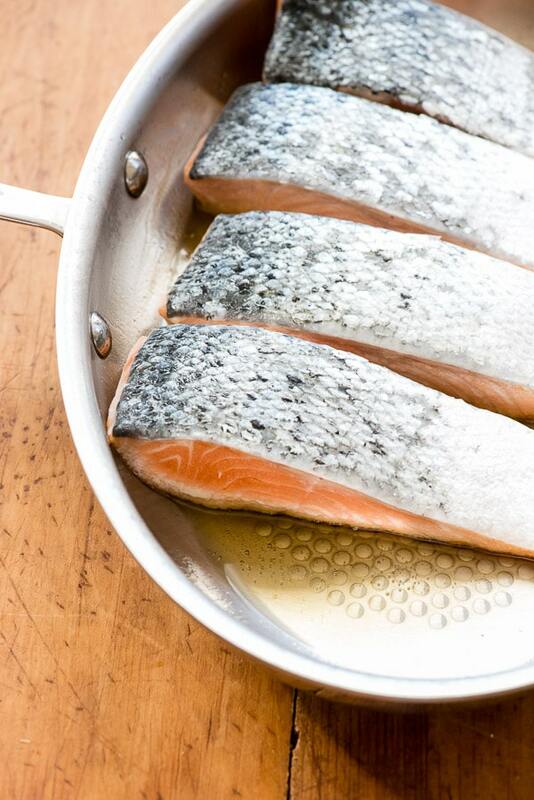 When the surface of the oil is shimmering, place the salmon steaks flesh side down in the pan. Cook for 3 minutes. Turn salmon over and cook for an additional 5 minutes until the fish is opaque in color and flaky. 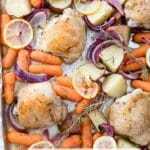 Remove from pan and place on a serving platter or individual dining plates. Reduce the heat to medium, add the butter, lemon juice and capers to the pan and cook, stirring constantly, until the butter has melted and the sauce has combined. Drizzle sauce over the salmon. Garnish with lemon slices and serve immediately. This sounds so incredible, I love lemon and caper sauce! I absolutely love cooking with capers! We’ve got salmon on the menu tonight. Giving this recipe a try! I fiend recipes like this to be so helpful. I have no clue how to cook fish. This dish looks amazing. I love a good salmon dish and I can’t wait to try it! 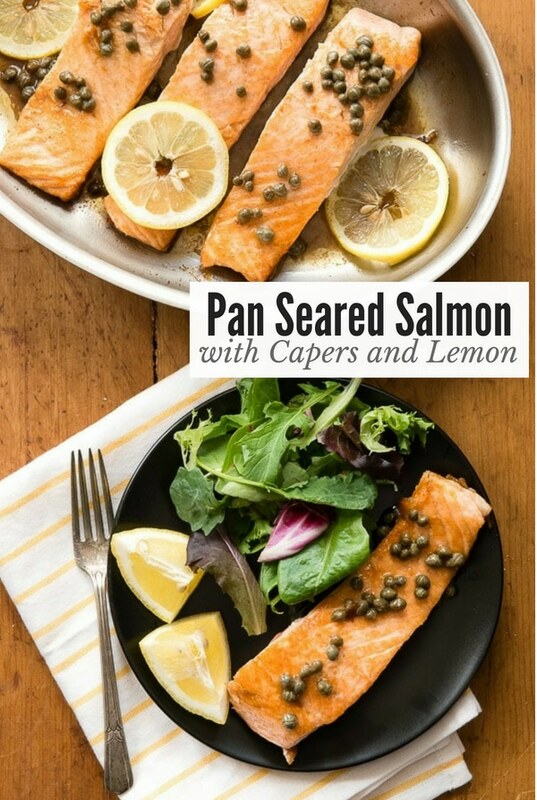 I love how lemon and capers go so well with salmon! 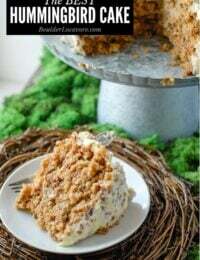 This is the best way to enjoy it, with a simple recipe like this that’s so tasty and easy to make! 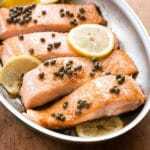 Yum, Salmon is favorite fish although we usually grill it but this recipe looks delicious so I think we will give it a try. Ok, now THAT is a recipe I can use capers in! I have never found a good way to use them, and love the flavor they offer. Thank you! Your pan seared salmon looks really good! This is also the usual way I cook them but I haven’t tried adding capers. I will cook salmon this way the next time. Salmon is delicious! I need to try this recipe for it, I haven’t had it in awhile. I am so happy that I can enjoy this meal on keto! It is perfect! I am just waiting for a really good deal on wild-caught salmon here. This definitely seems like it would be a great summer dish. I’m liking the sound of those flavors! I like salmon, but am always at a loss of ideas for how to prepare it. This recipe gives me inspiration! The Teen boy is all about is salmon. I must try this recipe to see if he would enjoy it. Plus I need this pan for sure. I really need to update my pans and throw out the old ones. What a delicious sounding meal! I love that it’s nice and light so it’s perfect for the summer. I love this fresh and FAST recipe! I absolutely love salmon and im always looking for a new way to cook it. This on the next grocery list for weekly dinners. And that pan is awesome, im adding that to my birthday wish list as well! Your recipe is beautiful. I also want to say that this pan is gorgeous! I need! My late husband would have gone nuts over this dish! It looks delicious! This All Clad skillet pan would be perfect for making my fave Lemon Tilapia with Spinach & Tomatoes! Love salmon.pan woulld do the job.